WBBM returned to the air in Chicago for the first time on February 24, 1925 broadcasting from the Broadmoor Hotel on Chicago's North Side. WBBM began broadcasting three days a week with mostly jazz. 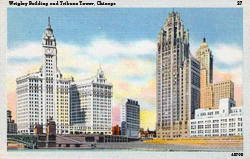 By the late 1920s WBBM had become the first Chicago station to accept commercial advertising. CBS acquired the station in 1928 as a CBS O&O station. WBBM added a 5,000 Watt FM in 1941 and a Television station in 1953. 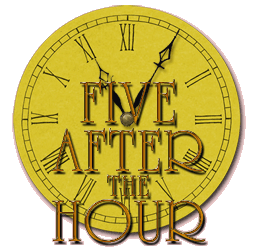 Five After the Hour premiered sustained over WBBM on May 16, 1945, broadcasting the drama anthology throughout the Midwest. WBBM had six years earlier discovered a young writer, director and producer within its ranks with great promise for a great future at WBBM--and CBS. Wunderkind Les Weinrott's rising star with CBS was being compared to that of Norman Corwin in some of the midwestern newspapers of the era. Also variously referred to as Illinois' greatest living actor or Chicago's greatest actor, Weinrott had become a real workhorse at WBBM having directed among other projects, the launch of WBBM's long-running and popular Those Websters situation comedy in 1945 featuring Willard Waterman. Those Websters was an extension of the long-running That Brewster Boy first heard over NBC [WMAQ] in 1941, much in the vein of The Great Gildersleeve's spin-off from Fibber McGee and Molly. That Brewster Boy had transitioned from WMAQ [NBC] to WBBM [CBS] in 1942. Les Weinrott's success with Those Websters gained him the opportunity to showcase all of his talents in Five After the Hour--writing, directing and producing--in a drama anthology series of his own. Five After the Hour was a Les Weinrott production all the way. Airing at five minutes after the hour [or half-hour], the name of the production seemed entirely apropos. The first five minutes on the hour or half hour in most markets presented the news. Weinrott left his mark on virtually every aspect of each of the series' twenty-three productions with the exception of the music direction and composition; the conductor for the series was Caesar Petrillo, with compositions by Frank Smith and Sal Stocco. The performers throughout the series represented many of Chicago's finest Radio actors. Virginia Payne, of Ma Perkins fame, performed in the series, along with Boris Aplon, Herb Butterfield, Jonathan Hole, Peg Hilyes, Florence Ravenall, Joan Lundin, Sherman Marks, and Mark Perkins, among many others. Curley Bradley, of The Tom Mix Ralston Straightshooters fame was also featured in one of Five After the Hour productions. Slotted during the late evening Wednesday nights, the series appears to have been on the order of a tryout of Les Weinrott's versatility. Throughout the Midwest the series aired at 11:05 p.m., well past the family hour in most households. Caesar Petrillo's underscore for the series was the equal of anything heard during the mid-1940s over the most expensive Network-wide productions. 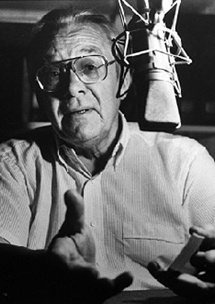 Even the series' announcer was yet another Chicagoland luminary--Ken Nordine. The entire series was broadcast and transcribed from the WBBM In the Air Theatre in The Wrigley Building. For its timeslot, Five After the Hour was definitely a cut above most of its late night competitors of the era, but Weinrott's writing and direction definitely leaned more in the melodrama direction than its evening competitors. It was also somewhat schmaltzy and ripe for the era, more reminiscent of the locally originated Radio dramas of the late 1920s and early 1930s. We'd therefore respectively question the regional comparisons of Weinrott to Norman Corwin. While many of Weinrott's scripts were very message oriented, they never rose to the level of the work of Norman Corwin. But while Les Weinrott was no Norman Corwin, he certainly continued to be in demand. 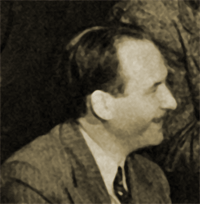 Les Weinrott went on to write and direct for Meet the Meeks (1947) for NBC, under Weinrott's "L. A. Weinrott and Associates" production packaging company. 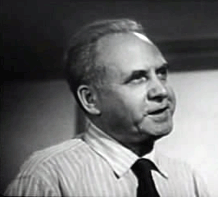 He also directed the Larry On Location (1949) program for local Chicago Television. Hickerson Guide, William B. Tubbs' "WBBM Goes on the Air in Lincoln, Illinois." 11:05--WBBM--Five after the Hour (C). Wednesday 11:05 Five After the Hour--WBBM. 11:05--WBBM--Five after the Hour: "A Memo from the Grave," Memorial day narration. 11:05 p.m.--Five After the Hour (WBBM): American folklore drama, "Song of the River." 11:05 p.m.--Five After the Hour (WBBM): "Amid the Blaze of Noon." 11:05 p.m.--Five After the Hour (WBBM): "Murder Has No Tongue." 11:05 p.m.--Five After the Hour (WBBM): "Mr. Black," drama of black-market operator. 11:05 p.m.--Five After the Hour (WBBM): "The Course of True Love--Of Course." COLUMBIA'S "Five After the Hour" series, presents an unusual type of dramatization on Wednesday at 11:05 a. m. over KGLO-CBS. Leg Weinrott is the writer, producer' and director of the series. Original music Is composed by Frank Smith. Orchestra is under direction of Caesar Petrillo. 11:05 p.m.--Five After the Hour (WBBM): American Fascist put under microscope in "Child of Ignorance." PRODUCER, DIRECTOR, writer and sometimes actor, Les Weinrott presents another of his original and unusual dramatizations Wednesday at 11:05 p.m. on KGLO-CBS' "Five After The Hour." Musical background in the orchestra under the direction of Caesar Petrillo. 11:05 p.m.--Five After the Hour (WBBM): "Primer for Prejudice." 11:05 p.m.--Five After the Hour (WBBM): "A Matter of Conjecture," satirical fantasy on fate of Hitler and Eva Braun. "A MATTER OF Conjecture, a satirical fantasy based on the current rumor that Hitler and Eva Braun escaped from Germany and are hiding somewhere in complete anonymity, is dramatized on KGLO-CBS' unusual dramatic series, "Five After the Hour" Wednesday at 11:05 p. m. Program is written, produced and directed by Les Weinrott, with original music scored by Frank Smith and directed by Caesar Petrillo. 11:05 p.m.--Five After the Hour (WBBM): fantasy, "Cinderella: Part Two." 11:05 p.m.--Five After the Hour (WBBM): "Hollywood Premiere" with George Jessel, Cesar Romero, June Haver, Phil Silvers, and Vivian Blaine. Ken Nordine was born in Chicago, Illinois in 1920. 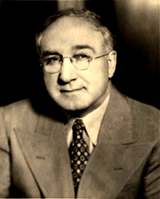 The son of an architect, Nordine attended Lane Technical College Prep School and the University of Chicago. During the heyday of The Golden Age of Radio Ken Nordine and his extraordinarily compelling voice was heard on That Men May Live (1943), The World's Great Novels (1946), The Adventurers' Club, American Novels (1947), Welcome Travelers (1949), and several other Chicago-origination programs throughout the 1940s and 1950s. Over the years his voice mellowed like a vintage wine, each year growing more and more compelling, reassuring, and rich, somewhat reminiscent of Nelson Olmsted. He married his wife of of 64 years, Beryl Vaughan, an actress in both Radio and Film, in 1945. The couple subsequently had three sons. Ken Nordine became even more widely popular in his own right during the height of the 'Beat' era of the 1950s. Nordine had orginated a creative, free-form spoken-word vignette poetry which he evolved over the 1950s and 1960s. His resulting Word Jazz, Son of Word Jazz, Love Words, and My Baby albums, with their jazz underscore by Chico Hamilton provided a highly innovative, soothing, and highly popular genre of modern poetry to a jazz beat. Ken Nordine is a fortunate fellow who enjoys double rewards for living a double life. Over national TV hookups, as a smooth-talking pitchman for deodorants, detergents and such (Stopette, Pamper Shampoo, Tunis), he earns, he figures, about $80,000 a year. But Nordine has his real fun and finds his real fans on his own show, which pays him practically nothing. Chapter & Verse. Once a week, over WNBQ in Chicago, tall, hollow-cheeked Ken Nordine recites poetry to a late evening audience. Perched on a stool, with a stepladder full of books beside him, the 34-year-old lowan reads earnestly in a subdued, husky voice, glancing from page to camera like a casual host reading to guests in his library. What distinguishes Nordine's shows from others like it is the flashing telephone by his side. He has adapted the disk jockey's request-format for poetry and made it work. When he finishes a poem, he picks up the telephone, listens to a new request from a viewer, and makes small talk while he leafs through his library to find the poem or passage wanted. Now for Nordine is broadcast after peak viewing hours, yet hundreds of listeners try to phone in every week. Those who fail to get through send in requests by mail. Last week he read, by request: Alexander Pope's "Ode on Solitude," Robert Frost's "Mending Wall," Elizabeth Barrett Browning's "How Do I Love Thee? ", Carl Sandburg's "Clean Curtains," I Corinthians 13. Although Now for Nordine is only a few weeks old, Nordine himself is no stranger to experimental television. For more than a year he has been frightening and delighting Chicago audiences with eerie readings of classic horror tales such as Poe's Pit and the Pendulum, Lovecraft's Rats in the Walls. He calls this show Faces in the Window, plays weird music as he reads and scares his listeners with a bagful of simple but effective tricks. For a story where a man is hanged, he had the camera turn slowly back and forth to suggest a corpse swinging on a rope. Trick lights and a turtleneck sweater make his cadaverous face appear to float in air, and sometimes a zoomar lens moves in until only one glittering Nordine eye fills up the television screen. The Big Money. Nordine keeps his programs simple because he has no time to rehearse. Each week he records commercials for more than a dozen radio and TV sponsors, acts on soap operas, announces local shows, narrates for Chicago's growing TV film industry. Nordine's own shows are unsponsored, but he has no intention of making them slick enough to sell. Says he: "Television tries to show off too much. I just want to sit down with people and read poetry." On the practical side, he also wants to stay in Chicago and keep on reading commercials. Thanks to tape recording, he can get his slice of the big-money network shows that originate on the East and West coasts. Fred Astaire once danced to a Ken Nordine piece, My Baby, on a television special. 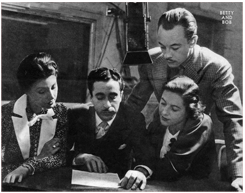 Nordine also narrated a documentary short, Against The Tide, in 1948. He was reportedly also Linda Blair's voice coach for the supernatural classic The Exorcist (1973). Over the last 30 years of his extraordinary career, Ken Nordine has provided the narration for numerous Film trailers and Television commercials, the most memorable of which were his series of Levis Jeans voice-overs throughout the 70s and 80s. Indeed, as late as 2005 Ken Nordine released a DVD video, The Eye is Never Filled. 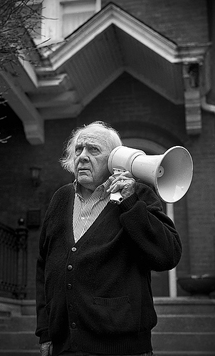 As of 2007 Ken Nordine was still hosting his own weekly Radio show and performing live in concert. Ken Nordine and his wife Beryl currently spend their time evenly between homes in Chicago, Illinois and Spread Eagle, Wisconsin. The couple have nine grandchildren by their three sons and their families. 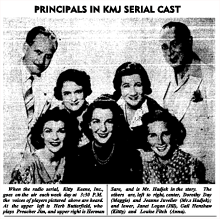 Herb Butterfield in character as Preacher Jim (upper left) is showcased in a newspaper teaser for 1939's Kitty Keene, Inc. serial melodrama. Born in 1895 in Rhode Island, Herbert Butterfield first entered Radio in 1926, appearing in several east coast serial melodramas and revues. His first credited roles came in the late 1930s with frequent appearances as a character actor in most of the more popular dramas of the era. Herb Butterfield also directed the Chicago NBC Key Station's productions of The Story of Mary Marlin (1934). Butterfield's early recurring role as Preacher Jim in the serial drama Kitty Keene, Inc. (1939) first established him as an attractive and reliable co-star. Upon relocating to California, Butterfield soon proved himself one of the West Coast's finest, most reliable and durable performers, Herb Butterfield became a fixture in most of the early detective and suspense dramas of the Golden Age of Radio. A Mutual-Don Lee player for many years, Herb Butterfield was a regular performer in many of the network's earliest syndicated West Coast productions. Indeed, Herb Butterfield's very recognizable voice was most associated with virtually every radio noir detective and crime drama aired over Radio. A favorite of Jack Webb, Herb Butterfield appeared in virtually every Jack Webb Radio and Television vehicle he ever produced, invariably playing either a crusty detective or a world-wisened, sympathetic tough. In Ellery Queen's eighth season, Herb Butterfield appeared as Inspector Queen. A regular on Radio's popular Halls of Ivy, Butterfield portrayed Ivy College Chairman of the Board Clarence Wellman for twenty episodes with the series' stars Ronald Colman and Benita Hume. 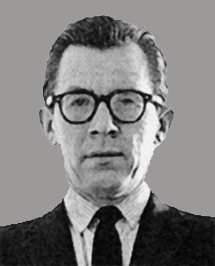 By then a frequent CBS player, Herb Butterfield appeared in seven of the CBS Radio Workshop (1956-1957) experimental radio broadcasts in a wide variety of roles. During his career in Radio, Herb Butterfield appeared in over 4,000 episodes. He compiled another forty appearances on Television during a career cut short by his death in 1959 at the age of 64. His last appearance in Television was in the Colgate Theatre comedy production starring Claudette Colbert, September 28, 1958. One of Radio's more ubiquitous performers, Herb Butterfield's distinctive voice lives on through the thousands of Radio episodes that have survived from the Golden Age or Radio. Consistently endearing, no matter what roles he appeared in, the characteristic fatherly tone of most of his performances hearken back to a time when American society was far more basic, forthright and genuine. Herb Butterfield fit that description to a tee.